The Jazz Exiles are back and they are here to stay! Check out “ELEMENTALS” on itunes, spotify or on the band website at www.groovydrums.com and fall into their groove and hang on for a fun ride! Additional Engineering by Taylor Kernohan at the Canterbury Music Co.
Mark Kelso plays Yamaha Drums, Paiste cymbals, Headhunters drumsticks & creations, EVANS drum heads & Plunge Audio in-ear monitors. 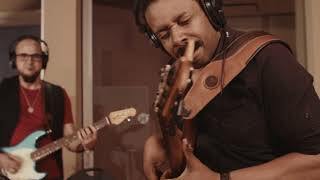 Rich Brown plays Jim Dunlop SuperBrights strings & Kenneth Lawrences basses. Luis Deniz plays P Mauriat saxophones & D’addario reeds & accessories. All songs composed by Mark Kelso.